Businesses and brands have already caught onto the immense power of the social stream that runs through Twitter and Facebook to track the pulse of conversations around consumers. Both tech giants and startups are competing to provide enterprise-friendly, social platforms to businesses that combine both collaboration and social media monitoring. 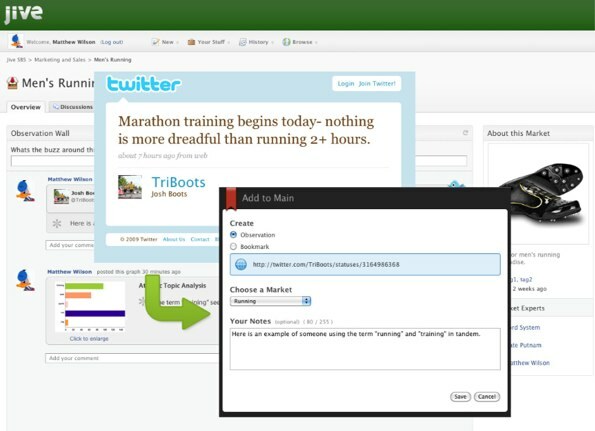 Socialtext and CubeTree offer compelling social collaboration offerings to the enterprise. And Salesforce.com recently entered the market with a new, more social version of its Service Cloud, and also debuted its take on a social platform for the enterprise, Chatter. Now Jive Software, a Sequoia-backed company that develops an all-in-one social enterprise software is acquiring Filtrbox, a startup that provides tools for social media monitoring, to boost its offering. You may remember Filtrbox as a Class of 2007 alum of incubator TechStars. The financial terms of the deal were not disclosed. Jive says that Filtrbox’s social media real-time monitoring technologies will be absorbed into Jive’s platform to help businesses and brands harness the power of the real-time web from within Jive’s collaborative software. Modeled to offer Facebook-like features to enterprises, Jive combines computing with social collaboration. Its suite of applications help businesses collaborate on a variety of tasks, including holding discussions, sharing documents, blogging, running polls, and social networking features and more. The company, which is profitable, recently launched integration with Microsoft SharePoint, letting Jive users easily access data and content from the CMS into Jive’s software. Filtrbox, which raised $1.4 million in funding last February, allows users to monitor thousands of content sources, including blogs, Twitter, Facebook and FriendFeed. After inputting the terms they’d like to keep track of, Filtrbox can send them continuous updates, weeding out duplicates (you can also choose to receive periodic digests). Filtrbox prioritizes feeds and dials the “noise” up or down to sift through information from social media blogs and other sites. It uses intelligence to adjust rankings based on how the user interacts with the data, and offers the ability to analyze the trends and influencers in an enterprise’s market. Jive says that one of the advantages of Filtrbox’s technology is that it has a scalable architecture that enables enterprises to process large volumes of social intelligence faster and at a lower cost. This isn’t the first acquisition for Jive, the company bought online calendar software developer Jotlet last year. Jive is wise to boost its offerings as it is going to be competing with Salesforce’s Chatter and other social offerings. But the company is ready for the fight. Jive recently raised $12 million from Sequoia Capital and also expanded its operations to Silicon Valley with a new Palo Alto office.